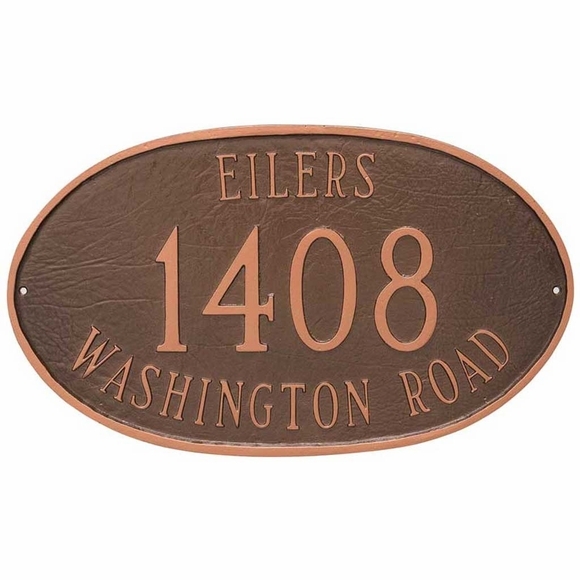 Oval Address Sign Plaque with Name & Address - - features your house number prominently in the center. Wall mount or lawn mount with purchase of optional lawn stakes. Custom made in the USA. Holds up to five (5) large 4" numbers in the center and up to seventeen (17) 1.25" characters around the top curve for your name and up to seventeen (17) 1.25" characters around the bottom curve for the street name. Sold with or without two optional lawn stakes. Personalized oval address marker includes a large house number in the center and surrounded by your name and the street name. Made in USA.